Hallowe’en 2005: Logic and reason can help the worker be more productive. This year, Jon’s started a mantra days before: “If I go to lots of houses, I’ll get lots of treats!” That said, not everything went to plan: we built the costume for early November weather and then it turned out to be the temperature of a September evening. The fleece hooves didn’t last long, and the headpiece occasionally had to be doffed for air. 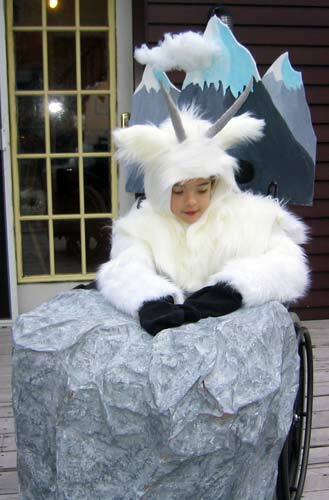 Laura made the fabulous goat costume, while I worked in shades of grey: horns, and the wheelchair foreground and background. We parents donned construction paper Lederhosen to accompany our goat. No still photographs exist of this, so unless some video of such a thing were to surface it will have to fade into the mists of mystery and horror. And were asked to yodel more than once, and the same applies to that. The street was crowded with kids, partially thanks to another great show on Langley Avenue this year. Some of our neighbours down the block put on a show, and each year they invest more into it: this year featured a stage mounted on the front lawn all the way to the sidewalk, three banks of theatrical lights, and lighting board, backdrop, and a cast of a number of adult neighbours and a ton of the neighbourhood kids. It’s incredible. This year’s theme was Ghostbusters, with homages to a number of horror movies. Oh man I just loved this costume, Jon! What a kid! Both meanings, of course. The rock is very good too. I would have liked to view the paper lederhosen. Next year, take a drive around this area — some people practically make movie sets of their houses for Halloween. Browning is amazing, too — artsy family neighbourhoods, I guess. Now one can’t help but be curious as what you’ll DO with the rock and the costume… Peter, Peter, put that down! Wow, love the costume!! Awww. Too bad we don’t get to see the construction paper Lederhosen. So — Jon, DID you get lots of treats? 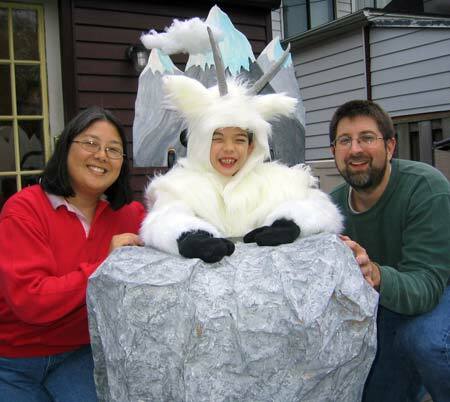 Awesome costume, but I will vote *not* to see the lederhosen – some things are too scary even for Halloween! Okay, if Jon’s name was William (which is my middle name), and he was wearing that costume, you could put a six-shooter in his hand and make him an Old West bad guy named – wait for it – Billy the Kid. You guys are SO talented with Jon’s costumes! Thank you for sharing the photos with me. Hmmm, Peter in leiderhausen ? Where are the pictures ?! !